Offering a fashionable, functional, and safe design that will delight parents, the modern-twist Mark-Mat placemat is ideal for providing kids with a clean eating surface while nurturing their inner artist. 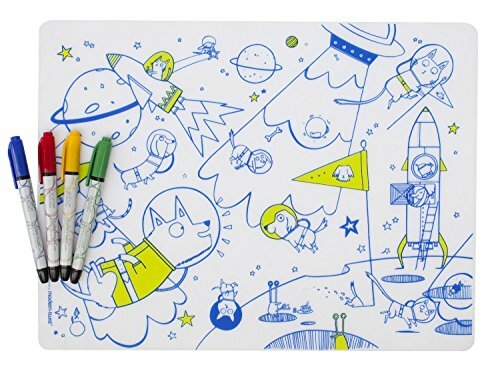 This reusable placemat features a whimsical motif designed by an independent artist that your child can color with the four included nontoxic, dry-erase markers (red, yellow, green, and blue). After each use, the Mark-Mat can be made like new with a wipe from a damp cloth or a rinse -- it can be colored again and again. It's also dishwasher-safe and won't crease or rip. Ideal for use on tabletops at home, at restaurants, or on the go, the flexible Mark-Mat rolls up for easy portability without damaging it. Like all modern-twist products, the Mark-Mat is made from 100-percent pure, FDA-approved food-grade silicone, an anti-microbial, nonporous material produced from natural elements that is free of BPA, PVC, lead, latex, phthalates, and other harsh chemicals. The Mark-Mat is heat resistant up to 425 degrees F, enabling you to place warm dishes on it to protect your table's surface (though it should not be used as a trivet). It also prevents crumbs and liquid from seeping through. This silicone placemat measures 16 inches by 12 inches (LxW). modern-twist has pioneered the use of pure food-grade, hand-silk screened silicone for placemats, table runners, coasters, baby products, and more with aesthetically inspiring designs that will enliven your home.